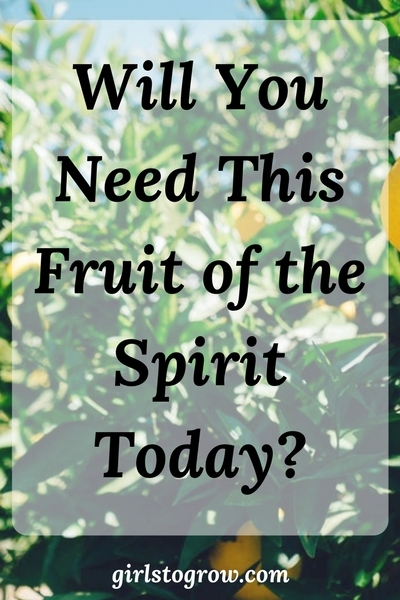 Will You Need This Fruit of the Spirit Today? Today I’m getting back on track with our study on the fruit of the Spirit. Over Christmas break, my older daughter and husband had the stomach flu. As I “nursed” them, I was very interested in noting how long they were actually ill. Was it running 12 hours, 24, or more? Obviously that’s not exactly what it means when we talk about longsuffering in a Biblical sense. According to this site, the word longsuffering is made up of two Greek words that literally mean “long tempered.” I also like the dictionary definition which says, “having or showing patience in spite of troubles, especially those caused by other people.” So basically it’s having a long fuse instead of a short one. God is not impatient with me. Psalm 86:15 says, “But thou, O Lord, art a God full of compassion, and gracious, long suffering, and plenteous in mercy and truth.” In my flesh, I sin and give Him so many reasons to give up on me. Yet He continues to extend grace, mercy, and compassion toward me. So if I want to become more like Jesus, I need to be longsuffering. I once heard someone say that longsuffering relates to how you deal with people, while patience is how you deal with things or circumstances. The verses below definitely deal with how we’re to be longsuffering toward others. In fact, we’re commanded to act that way. Do you see a similarity between these verses? What word is close to the word “longsuffering” both times? Mmhmm…it’s meekness. It seems to be tied in with longsuffering. Perhaps I’m more longsuffering when I see my own weaknesses clearly. When I’m not prideful or worried about defending my own rights, it’s easier to be longsuffering. Putting others ahead of myself leads me to be tolerant and forgiving. (Ouch, stepping on my own toes here!!) But meekness is another fruit of the Spirit that we’ll get to later! As wives and mothers, the opportunities to be longsuffering within our families arise almost daily. Sure, there are moments when I feel justified over losing my temper or showing my frustration. But that’s now how God is. When I think about how God is so longsuffering with me, I have no excuse to be irritated or provoked. As we go through our day, may we yield to the Holy Spirit in those moments of irritation, and allow Him to produce longsuffering in us! Who’s the Boss – Feelings or Truth? I love that description of longsuffering, that it’s having a long fuse instead of a short one. As you say, my children give me plenty of opportunities during the day to practice longsuffering, and I certainly can’t be patient with them on my own power. Truly, thank you for this today. It’s exactly what I needed to be reminded of. I hadn’t heard Joyce Meyer say that, but now I’ll remember it when I think of this word! I was searching Pinterest for something relating to our youth group which my husband and I lead at our church. Imagine my surprise when this blog pops up and I recognize the author as my high school history teacher’s wife 🙂 Needless to say, raising 3 girls (and 1 boy) of my own, I spent quite a bit of time on your site; I’m looking forward to reading more! How neat – so good to hear from you!! Glad you found something helpful 😉 Love to hear that you’re leading a youth group, and now raising sweet kids of your own! !